There are many problems and injuries that can happen to the knee at different stages in our lives, some common knee injuries are listed below. Medial collateral Ligament (MCL), Lateral Collateral Ligament (LCL), Anterior Cruciate Ligament (ACL), Posterior Collateral Ligament (PCL) are the four main supporting ligaments to the knee and the most commonly injured. Ligament damage is graded 1-4 (1 being a mild strain, 4 being a serious tear/rupture, possibly requiring surgery). Osteopathic treatment can really help with the recovery of ligament damage, by working with the foot, ankle, knee, hip and pelvis osteopaths can help unload the biomechanical strain off the knee and ease the tension going through the knee as well as improving the speed of healing through manipulation, massage and advice about exercises rehabilitation, dietary supplements and joint/ligament supports. The knee has a highly specialized cartilage inside it (the meniscus) and this can be prone to damage especially traumas involving rotation (twisting of the knee), the meniscus can often get damaged or strained simultaneously when the ACL or PCL is torn (see above). The meniscus can be torn in the elderly as a result of osteoarthritic changes in the knee joint and a weakening of the cartilage (a degenerative tear). This can often happen during walking, squatting or twisting and can result in very acute pain in and around the knee, swelling, clicking and potentially locking of the knee. Depending on the extent of the damage will determine how the knee is treated. 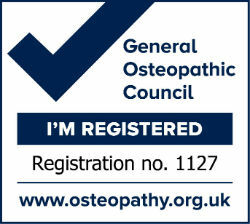 For low grade strains osteopathy can help. If the injury is more sever then orthopedic surgery may be required to stitch the tear and clean out the knee of any floating debris. The two main reasons people injure themselves are because the joints and muscles are very stiff and tight or too weak and unable to cope with the demand placed upon them. Restriction in movement and poor flexibility often leads to overstrains, tears and excess pressure on other areas of the body. Muscular weakness causes imbalances in the body, reduces strength and stability, leads to overstrain/ fatigue of the muscles, ligaments and joints and causes injury. Osteopaths often advise stretches and exercises to help strengthen the body and improve flexibility. This can greatly improve healing time and reduce the risk of the same injury occurring again. Exercise strengthening, rehabilitation and stretching can be offered to high level sportsmen and women as well as those who have recently started a new sport, activity or a more active lifestyle and are being troubled with pains. Growing teenagers who play lots of sports (especially high impact like basketball, football and tennis) can get a condition known as Osgood's Schlatters disease. This is inflammation of the patella tendon and also the area of the bone that the tendon attaches to. It can result in a very painful and swollen lump developing on the front surface of the knee just below the knee cap and causes extreme pain when running. Osteopathy can greatly help with this condition as it is commonly caused by very tight and overused quadriceps (thigh) muscles pulling strongly on the bone that they attach to creating an inflamed and painful bone/tendon. Also known as Repetitive Strain Injury ("RSI") of the elbow, "archer's elbow" or "lateral epicondylitis" is a condition where the outer part of the elbow becomes sore and tender. It is commonly associated with gripping tightly or repeatedly grasping something heavy or something regularly. Playing tennis, racquet sports, manual labor such as using a hammer or hammer drill or repetitive wrist movements such as typing or playing an instrument such as a violin can also cause an overuse of theses muscles. The injury can happen to almost anybody and is can be progressive unless the biomechanical strain is eased. This is pain and tenderness on the inside of the elbow and is commonly associated with playing golf and manual labor , the condition has the same onset as "tennis elbow", however, effects the inner portion of the elbow as opposed to the outer portion due to a different set of muscles involved. There are many ways to sprain the ankle and each can effect a different part of the ankle. The most common being the "inversion sprain", (turning the ankle, rolling the ankle, twisted ankle). This is where the foot turns inwards and the outer part of the ankle gets sprained. This type of injury can tear the lateral ankle ligaments, strain the joint capsule around the ankle, jam some of the bones on the foot and ankle, tear muscles in the front/ outer part of the shin and occasionally fracture the ankle. There are 4 levels of ligament damage (like with the knee) and the recovery time very much depends on the extent of the damage and how quickly the ankle is rehabilitated. Osteopathic rehabilitation consists of reducing the swelling and inflammation, breaking down incorrect scar tissue formation, mobilization of the foot and ankle, easing the muscular tears and strains, strengthening exercises to the foot and ankle and dietary supplements to speed up the healing process. The rotator cuff muscles are a group of four very important muscles in the shoulder. They are the prime movers and dynamic stabilizers of a very mobile thus relatively unstable shoulder complex. Due to the high level of stress and strain the shoulders get through our lives it is common to strain and tear muscles, tendons, ligaments and the shoulder joint. These type of injury often results in pain raising the arm, sometimes in one specific direction but often in multiple directions. Other symptoms may include, weakness, stiffness, swelling, heat, nagging/burning pain. This can usually be treated by an osteopath along with advice on pain management and exercises rehabilitation.